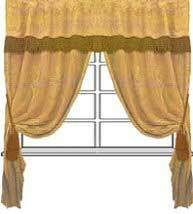 This curtain pattern is for a valance attached to the top of a curtain. You can have the enhanced look of a double layer without the need of two tracks. Get inspired and give your windows a new look.